My darling husband got me a Vitamix for Christmas. He also got me the Dirty Dancing Limited Keepsake Edition so he’s obviously a keeper. He may not have felt the same about me though after hearing my initial reaction upon opening the Vitamix. You see, I opened the parcel and said…" we already have a blender." Yep, I sure did. And yep, I sure did feel like a total a@# when I did a little research on this freak of nature machine. Now, scientific explanation is the furthest of my strong suits so I’ll explain it to you like this; this machine acts as a food processor, cooks AND blends soups at the same time right there in the container. On the other hand it blends AND freezes sorbet at the same time (some kind of freezing mechanism in the motor or something). You can knead bread in it and make your own flour. You can make your own dairy alternatives like almond or rice milk. There are some other things too but that’s all I can process at the moment. Anyway, to say the Vitamix is a remarkable machine is an understatement. Just don’t call it a blender. 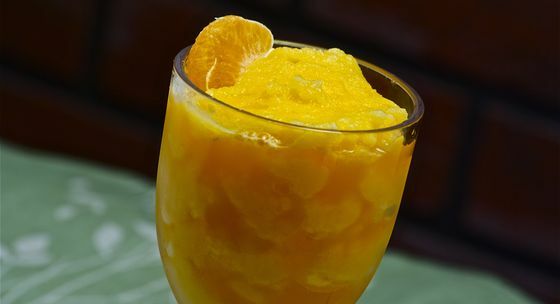 The first thing I made with it is this delicious mandarin orange sorbet. 1. Place all ingredients in the vitamix in order as listed. Secure lid. 2. Select variable 1. Turn machine on and quickly increase speed to variable 10, then to high. 3. Use the tamper to help push the ingredients into the blades. 4. In about 30-60 seconds the sound of the motor will change and four mounds should form. 5. Stop the machine. Don’t over mix or the sorbet will melt. I've been looking for ice cream and sorbet recipes for the new ice cream maker I bought the other day. I've found some good one, but this looks so unique and refreshing - definitely will be one of my first attempts. Thanks for sharing!! Had a craving for sorbet yesterday, but I went out and bought some...this looks divine, can't wait to try it out.